Fire in the Lake- Board game. This afternoon I went into town to pick up a parcel that was waiting for me; it was either text books or a new board game… Fortunately for this blog it was the latter. 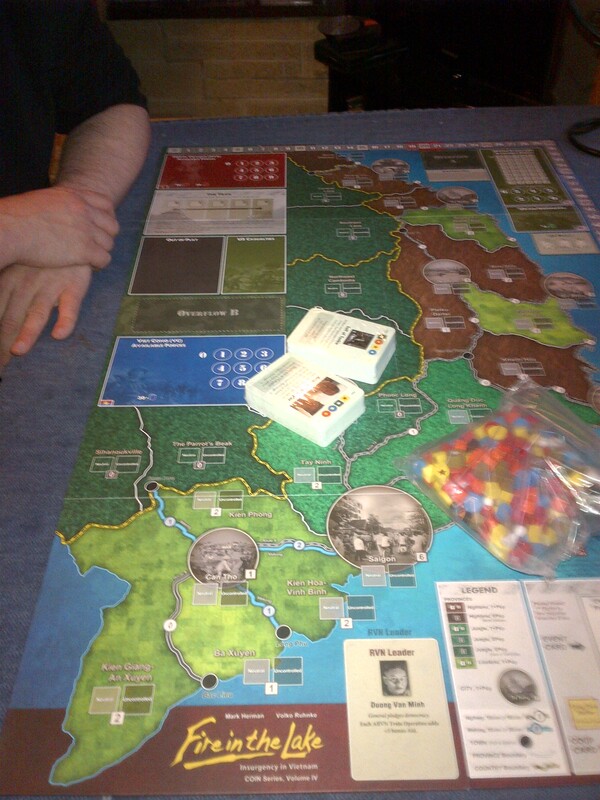 Fire in the Lake: the latest installment in GMT Games COIN series had arrived (great price and service from IGUK). This one is the fourth that they have produced- see my earlier post on the Afghan and Colombian games. I was quite excited to see what was in side so I ripped off the cellophane and rummaged through the rather heavy box. The game is up to the usual high standards the GMT Games always seems to achieve- great heavy duty board, solid pieces and plenty of reference sheets too. The four game able factions are: ARVN, US, VC and PAVN. It will be interesting to see how the rivalry between the latter two factions plays out given that they are ostensibly on the same side. One of the notable features of the game is that any of the factions can be gamed via the mechanics if there are not four players in the game. A rather detail;ed flow chart system is used, though it is quickly picked up in game. It does provide a tough game too so nothing is lost in the game experience if you don’t have a full set of players. For those that have not played any of the games in the series they all use a card driven mechanism to determine player order in each turn, this can lead to a player either taking the event on the card or taking another action. All of the cards have been drawn from the history of each war, though they will often come out in an ahistoric order; Fire in the Lake for the first time introduces a mechanism that classifies the cards by year so that they event better fit the scenarios in question (so no references to Linebacker 2 when game time is 1966 I’d imagine) again something else that I’m looking forward to exploring when I get round to playing it. I’ll probably get Brian round to run through the games introduction first before I jump into a full game… watch this space for a fuller report. I’ve been busy in the shed trying to reduce the kit and bare lead pile. Here are some pics of what I’ve recently finished. 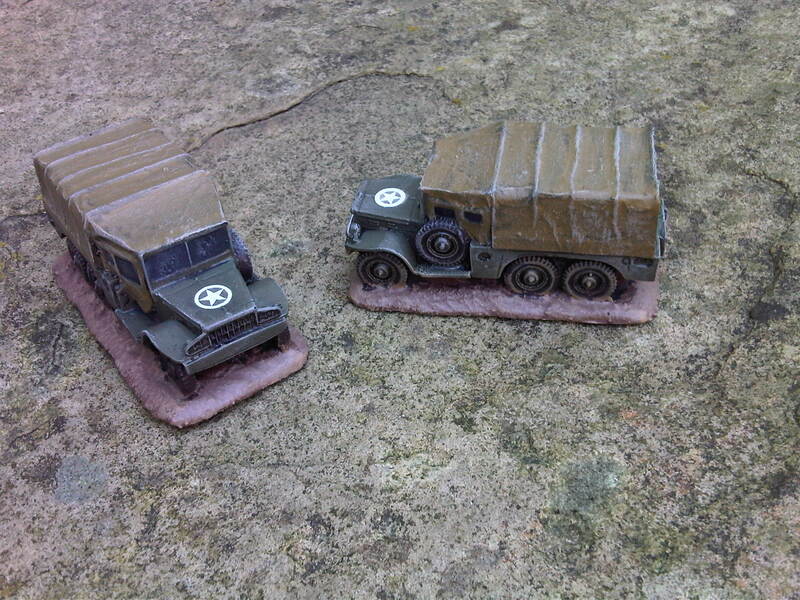 A pair of Ready to Roll Dodge trucks- great for WW2 and possibly Korea. 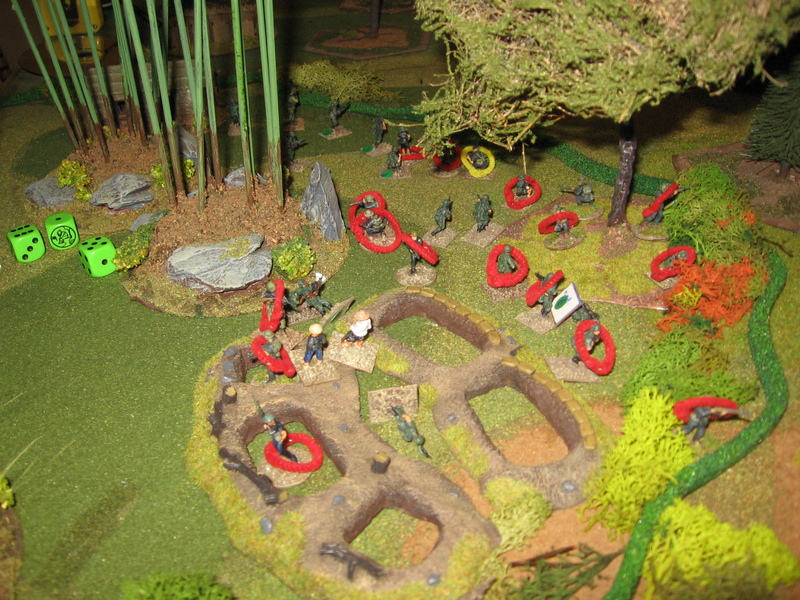 A mixed bag of plastic US for Vietnam. 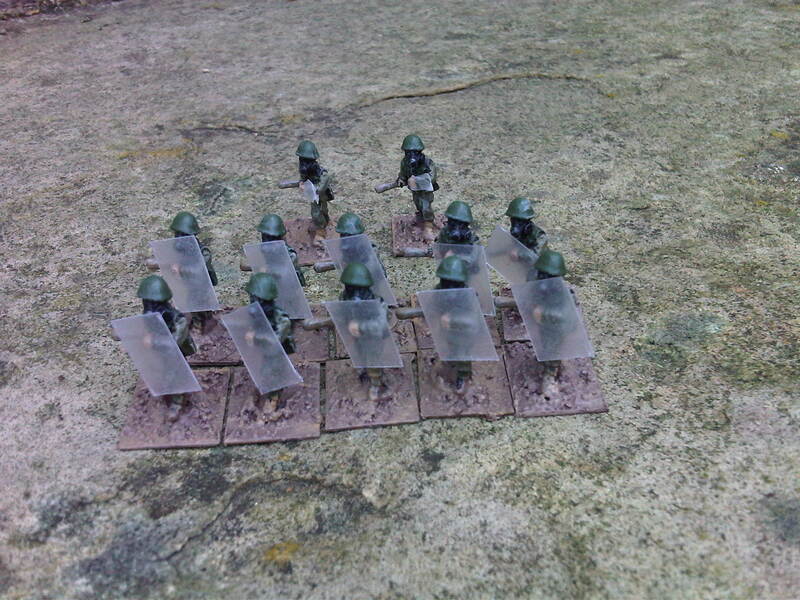 Eureka Miniatures Riot troops, UK soldiers in early 70s kit. Ostensibly for Northern Island but I’ll be using them for my urban chaos style games. 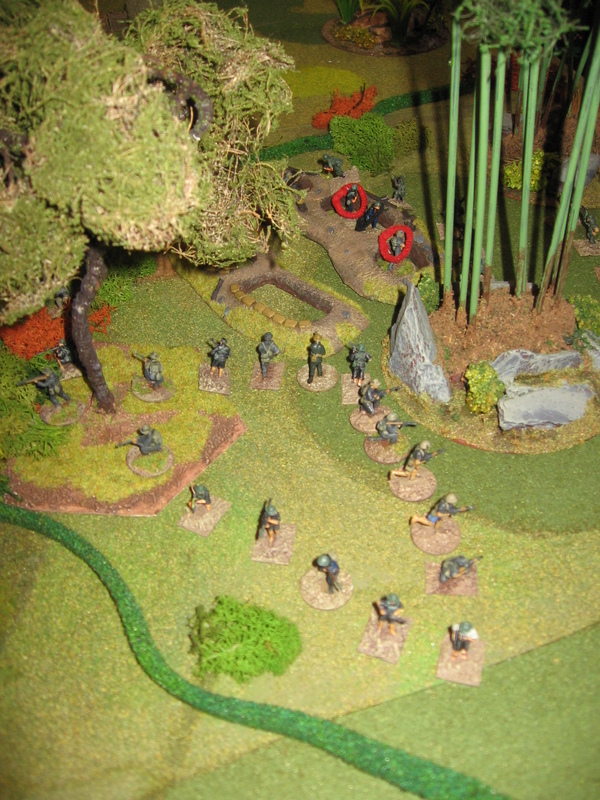 AAR- The Battle under the canopy. For this weeks game Brian, Chris and I decided to try out the campaign system from 2 Hour Wargames FNG ruleset. Basically you generate a squad according to the rules and then guide them through a tour of duty. A really nice mix of an RPG and a skirmish game as you have individual attributes for each squad member that can be either an asset or a hindrance. 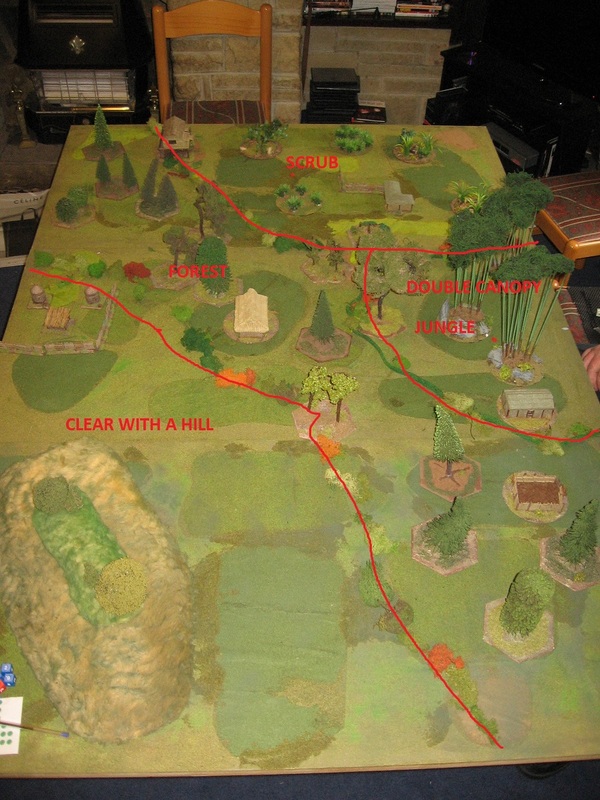 Once the squad were generate I rolled up the mission and terrain; I have to point out that I didn’t really take any part in the game. I merely ran the rules. All the actions that the VC took were randomly determined, I just kept the game going. I’ll let Brian and Chris add in the comments section a description of their squad and how the game went. 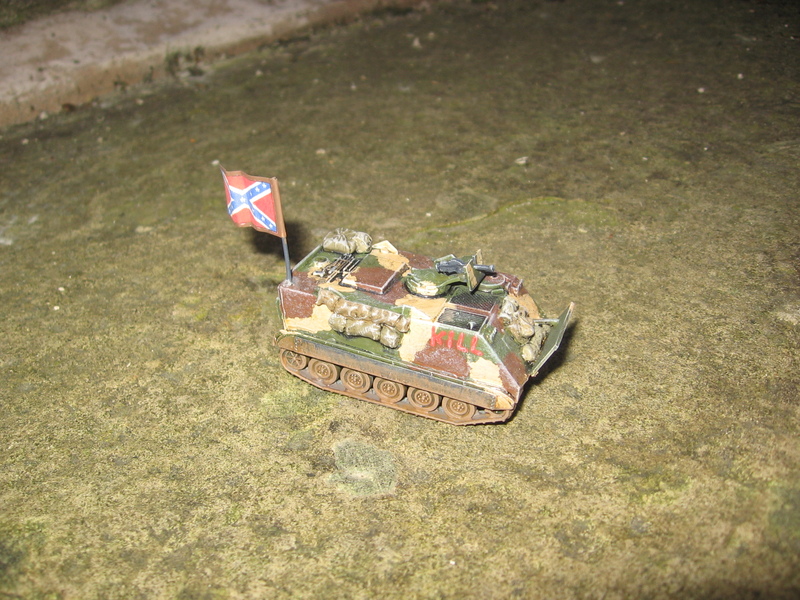 As for the game the dice decided it was July 1966, somewhere in the interior of III Corps area. 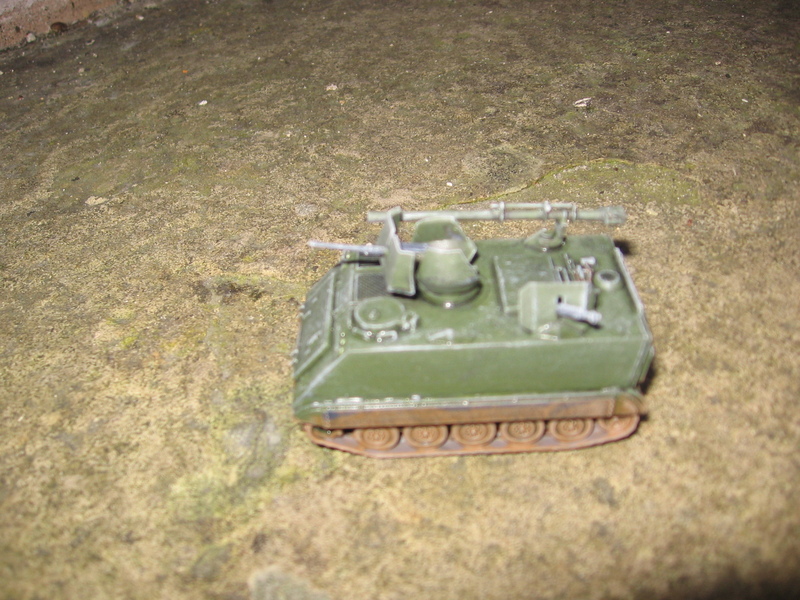 Both squads were detached from the platoon to conduct an evening patrol (only 5 turns of the 14 turn game took place in daylight) fortunately the weather was clear for the mission. I divided my 6 by 4 foot able into 9 areas and diced for terrain and PEFs (PEFs are a rule mechanic that represent a possible ‘something’ out there. Could be something from a abandoned position to a platoon to a bad case of the nerves), 9 areas seemed a bit crowded so next time I’ll drop it down to 6 2 foot squares. 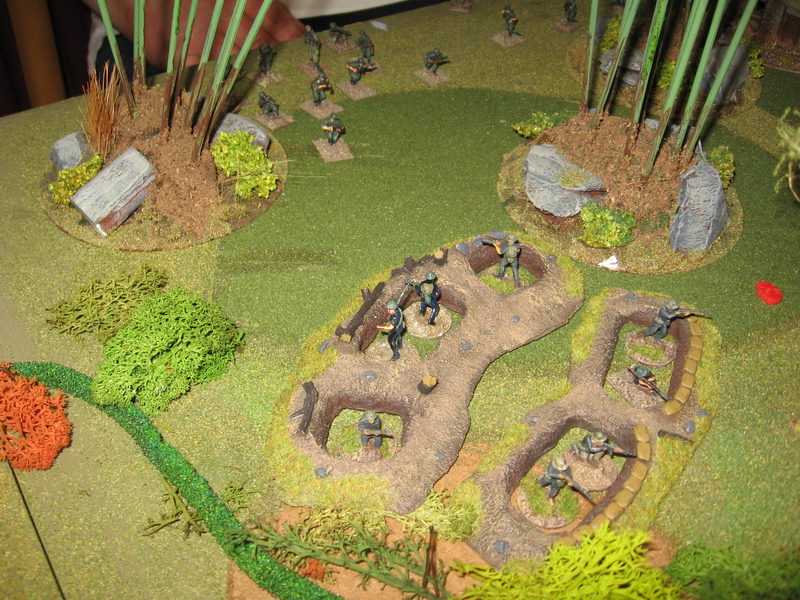 The terrain featured a patch of double canopy jungle, where all the fighting happened, surrounded by forest and scrub before going into a clear but hill corner. A Few buildings were dotted about but they were empty of civilians. The game took a bit of prep work and I needed a lot of stuff brought through out of the shed just in case it was needed from a dice roll. To keep the atmosphere going I put on some Doors and Jimi Hendrix CDs too. 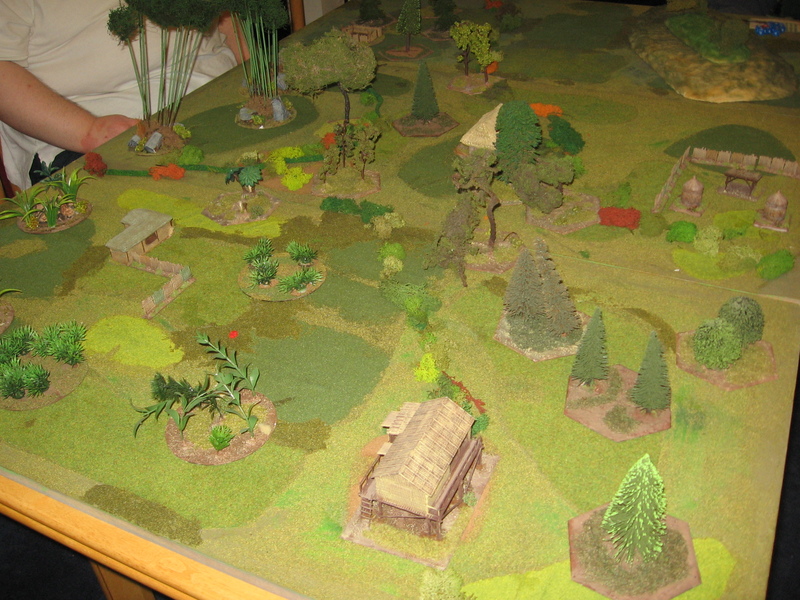 The game table showing terrain types. The arrival of the MFVC that was to be Brian and Chris’ was determined in part by the Poltical status of the region the game was set it: in this case level 3: Pacified. However when rolling for the Enemy Activity Level I rolled very high getting a 4. Free World Forces (FWF) support was set at 3. The numbers of PEFs present ended up at 7. 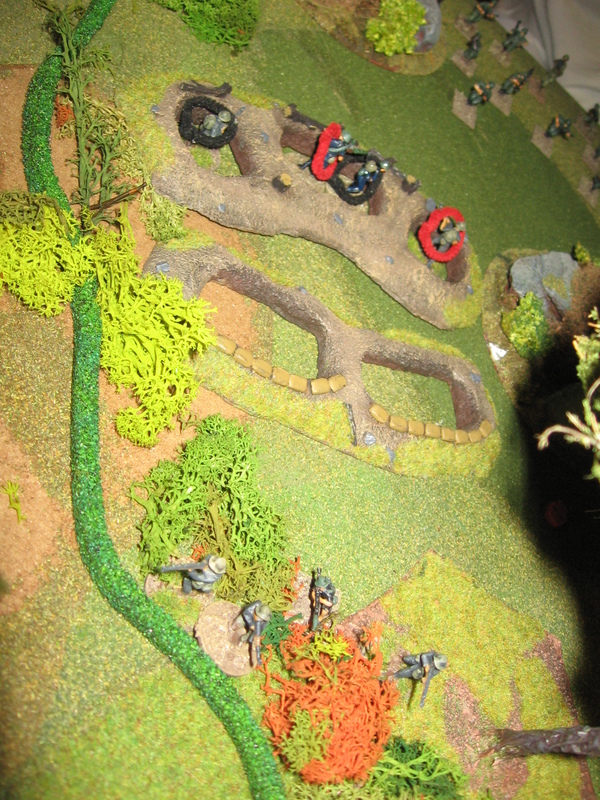 One of which turned out to be a squad in a defnesive position. One short firefight later with Chris’ squad half the VC are dead or out of the fight the remainder are running for it. 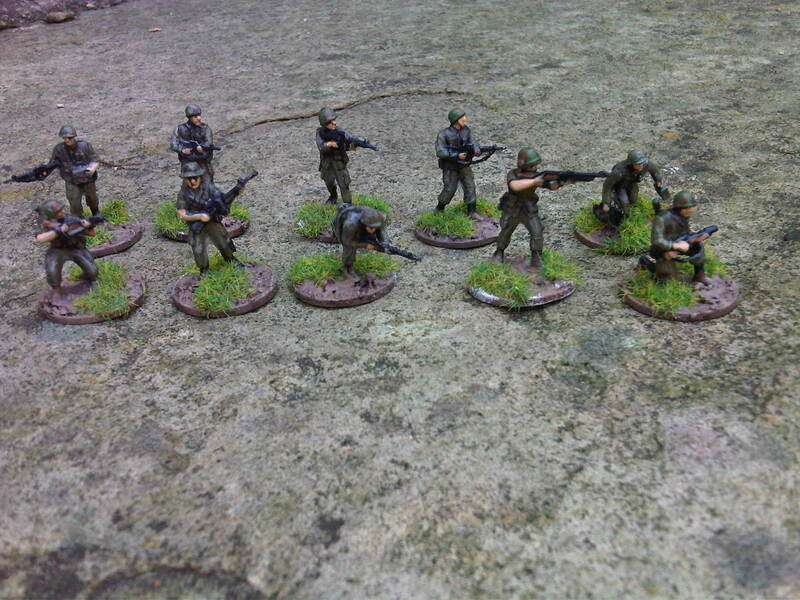 … a full MFVC platoon having a chinwag. 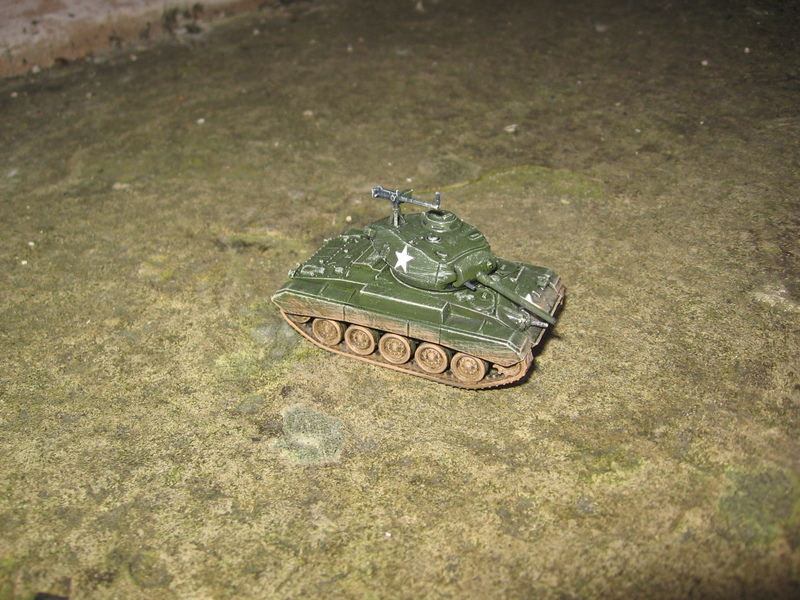 Another, bigger, firefight took place, much use was made of grenades, and Chris’ squad came out on top. Dealing with the masses of VC that the US stumbled upon allowed the other PEFs on the table to form up and attempt to swarm the the now stalled US patrol. Chris’ squad on the US right flank took the worst of it with a MMG team and 2 assault teams turning up and attempting to rush the grunts. Resulting in some nasty melee fights. 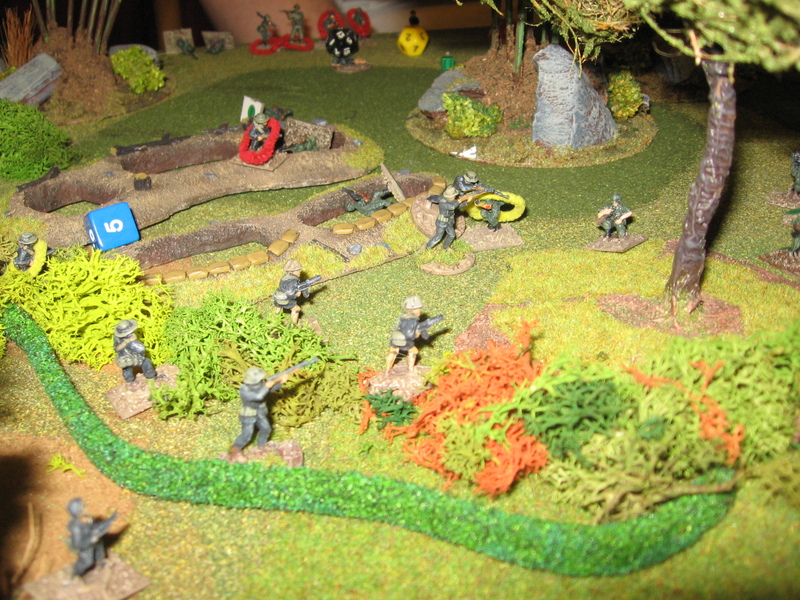 A VC assault team moving in for the kill. 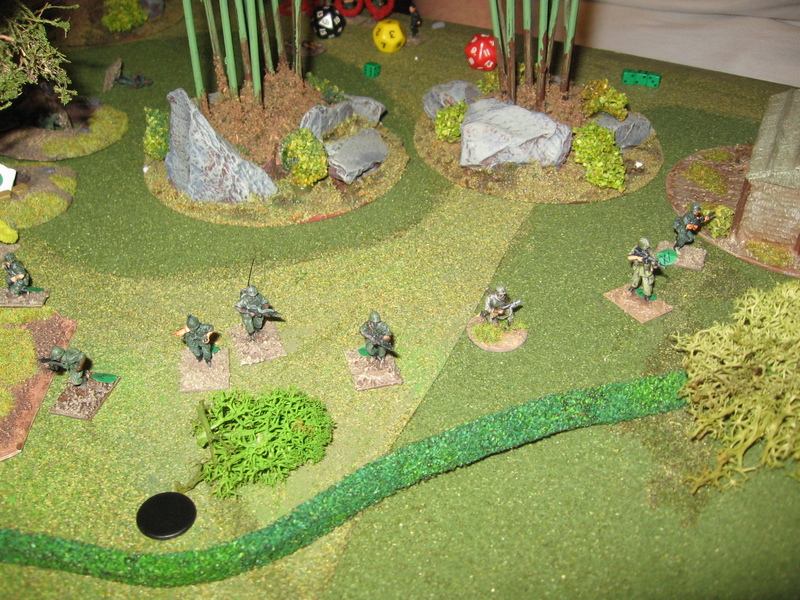 Bad activation dice rolling meant for a couple of consecutive turns the US were impotent while the VC moved in. 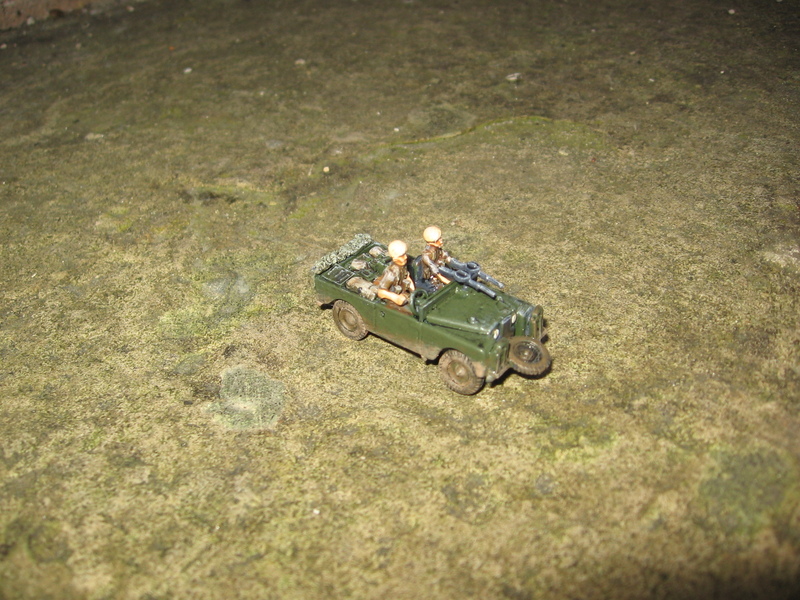 Brian’s squad on the quieter left flank tried and failed to call in some danger close mortars to held out his beleagured team mate. Instead he consolidated his position but only found a tunnel entrance for his trouble, which he duly noted for later destruction. While this was happening his medic tried to help Chris’ now much depleted squad but that selfless act got his killed. 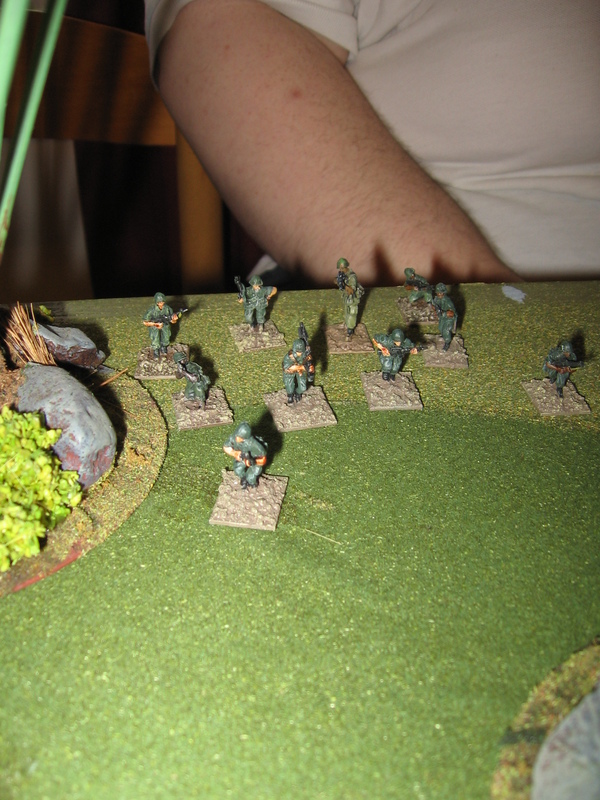 Another VC assault team about to overrun the remains of Chris’ squad. 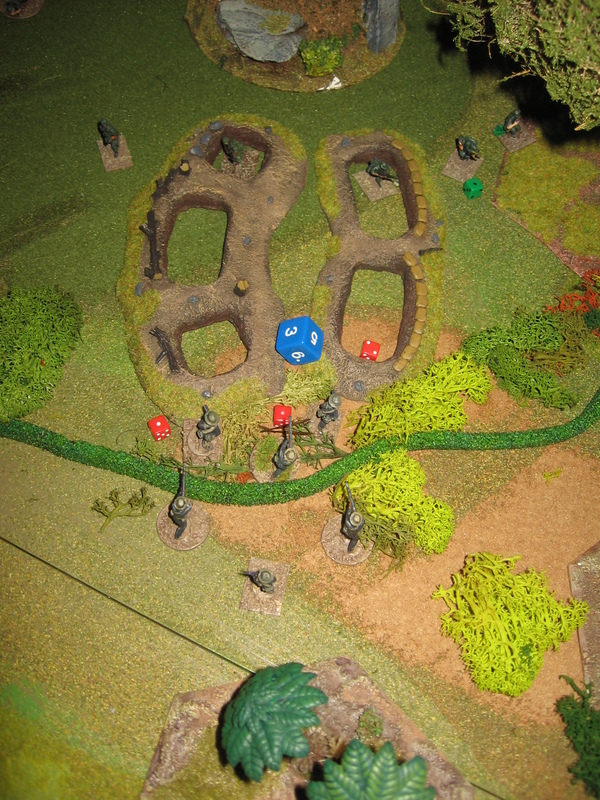 After ten turns the US withdrew from the field of battle, without moving beyond their first area all game. 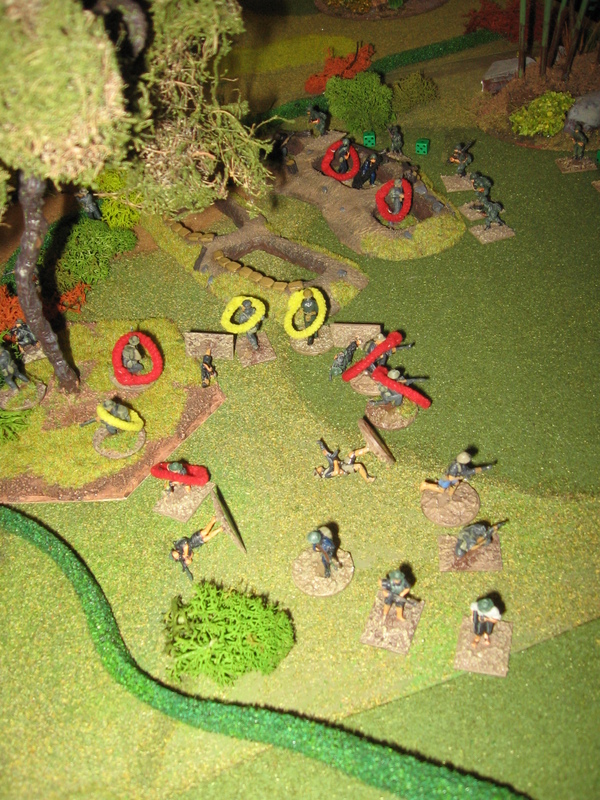 However the sheer number of VC killed meant that on paper the game was a win for the FWF. Chris paid a heavy price- many wounded and a nearly unforgivable 4 MIA. All what was left to do was tidy up and write a must see list of ‘Nam films for Chris to watch to bring him up to speed. It was a thoroughly enjoyable evenings gaming. I’m looking forward to running through my own platoon in due course too. Starting this new year I’ve been keeping a log of what I’ve got done. Having it written in down in black and white has made me more productive. So hopefully this will continue. I ordered some more figures from Elheim. I got some assorted special ops types, both modern (GWOT), Vietnam (SOG) and fictional (based on the Predator film), a pack of the new cold war Brits. 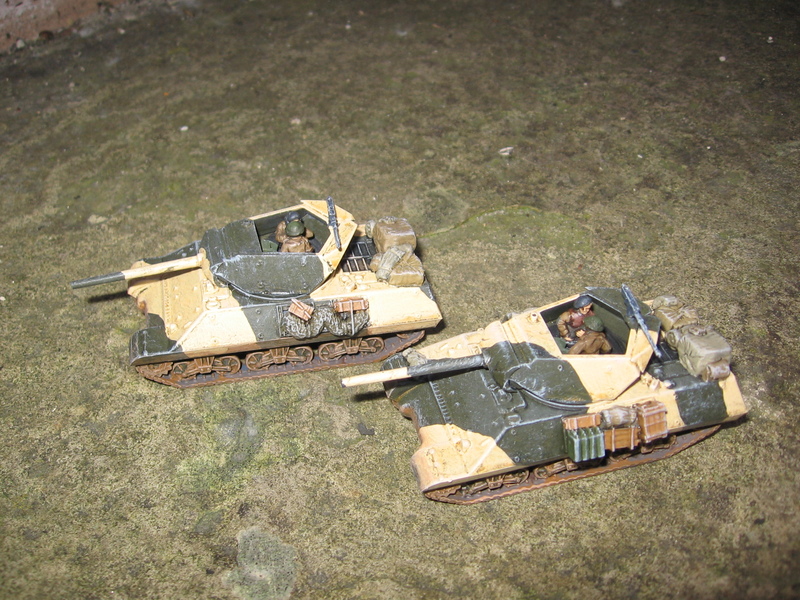 These will go well with the Falklands era Brits I posted earlier. 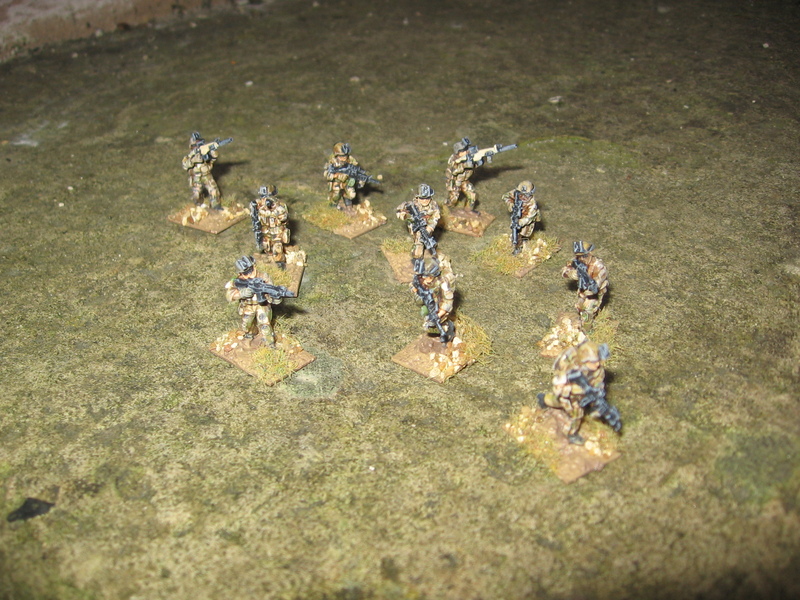 Also some USMC (GWOT as well) these have a variety of weapons to add variety to the 6 fireteams worth I’ve already got. Managed to get a few games in too. A SWAT raid as well as a convoy game design by my friend Evan. I took some pics so I’ll upload them in due course. Xmas was OK- had better, had worse- I’m really a ‘Bah Humbug’ sort of person. However Santa was extra kind- directing people to my Amazon Wishlist really paid off as I got a big haul of books this year. Started reading ‘Ian Flemming’s Commandos’ half way through it already so it comes recommended from me. 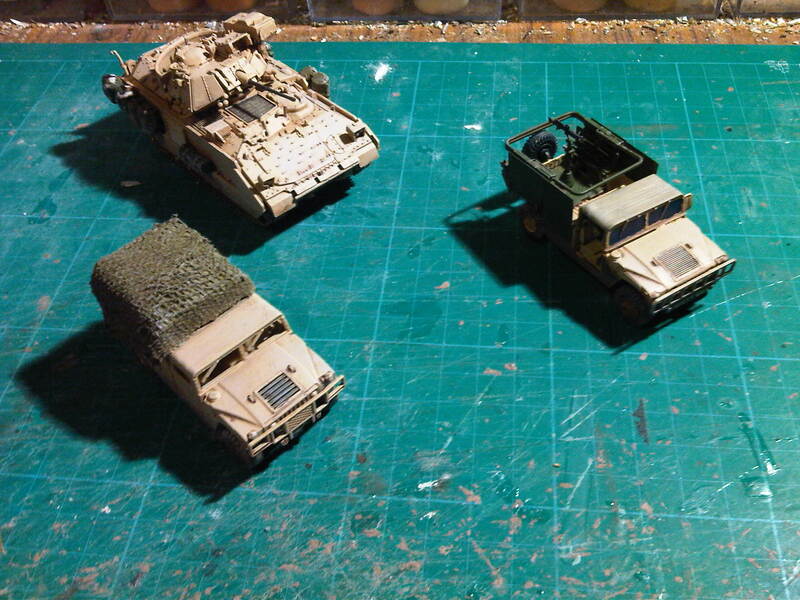 A trio of modern US Vehicles- all from plastic kits. I’ve got a Iraq convoy game planned for them. The idea will be to go up one side of the board and then U turn to go down the opposite side. That way I get 12′ plus of road out of my small board. Hope fully the route Irish DVD I also got for Xmas may provide extra inspiration… pics once I’ve played the game. 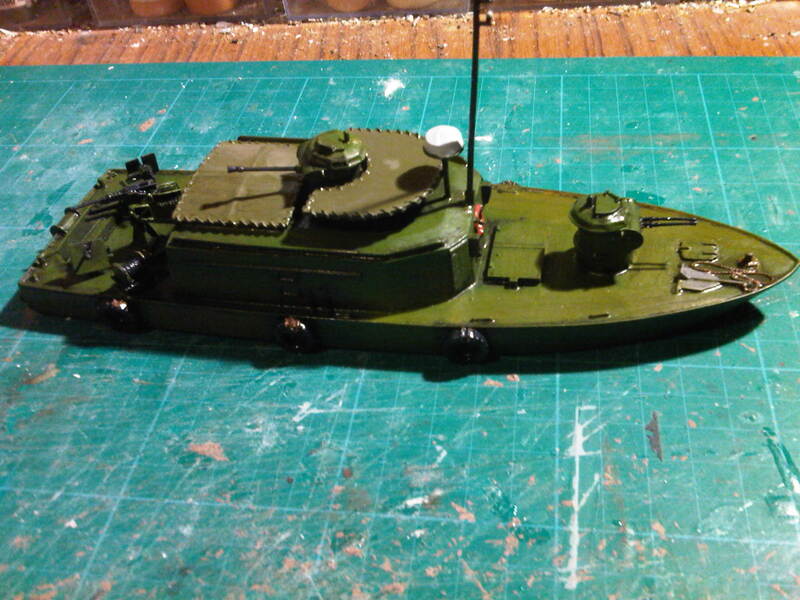 At Triples earlier this year I picked up one of the Skytrex Riverine boats- in the case a heavily armed Alpha boat, packing a 20mm cannon turret, Twin .50 cal turret, 2 pintle mounted .30 cals and a .50cal/ mortar mount. Likewise I’ll be working up a suitable scenario for it (and trying to resist the temptation of buyi9ng more of the range). I also finished of a batch of modern Africans- but I want to wait until my entire collection of them is completed before I post pics….